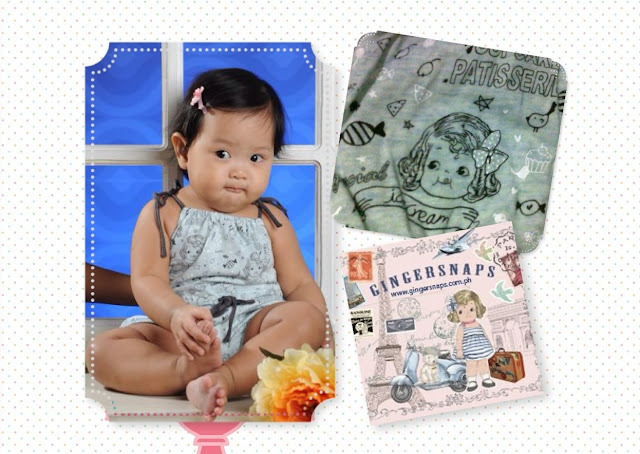 There's this local brand of kiddie clothing we love called Gingersnaps. They make the most stylish baby dresses, rompers, and tees. Comfort isn't sacrificed for style. Be it casual everyday wear or special occasion dresses - everything is super comfy! We love it so much that most of Ally's clothes are from Gingersnaps. But this post isn't meant to be a review. Just wanted to share this cute coincidence. Doesn't Ally look exactly like the Gingersnaps character on her romper? Give her golden curls, and you'd think the character was based on her! Teehee!